Oh hey, guess what? The Sun never stops working to keep things on Earth running smoothly. (That's why it's been Employee of the Month for 4.5 billion years.) So why does the Sun get to be the center of attention? Because it's our solar system's very own star! 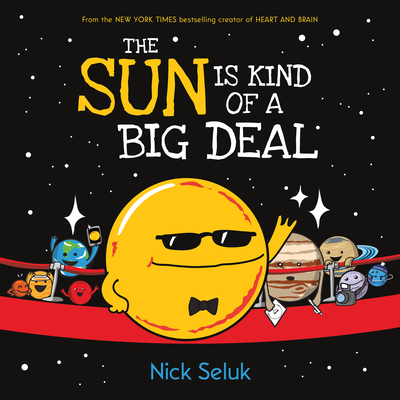 This funny and factual picture book from Awkward Yeti creator Nick Seluk explains every part of the Sun's big job: keeping our solar system together, giving Earth day and night, keeping us warm, and more. In fact, the Sun does so much for us that we wouldn't be alive without it. That's kind of a big deal. Each spread features bite-sized text and comic-style art with sidebars sprinkled throughout. Anthropomorphized planets (and Pluto) chime in with commentary as readers learn about the Sun. For instance, Mars found someone's rover. Earth wants the Sun to do more stuff for it. And Jupiter just wants the Sun's autograph. Funny, smart, and accessible, The Sun Is Kind of a Big Deal is a must-have! Nick Seluk worked as a graphic designer before becoming a full-time illustrator. He is the creator of the popular Awkward Yeti comic and author of the New York Times bestselling Heart and Brain, and its follow-ups Gut Instincts and Body Language. His work has appeared on CBSNews.com, Huffington Post, Buzzfeed, reddit, and blogs across the internet. Nick lives in Michigan with his wife, three kids, and a very awkward dog. You can find more info on Nick at theawkwardyeti.com.